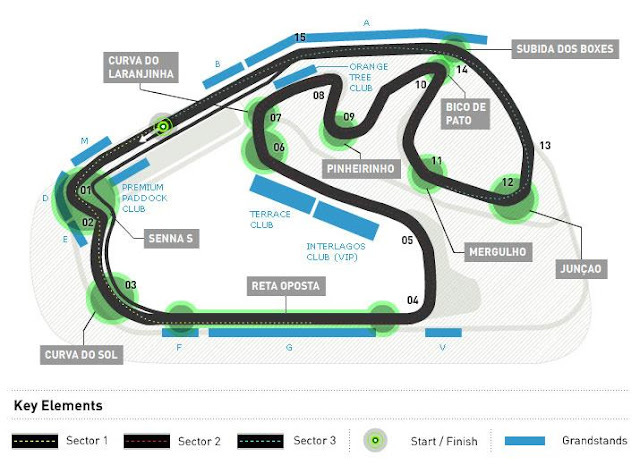 Round 19 of the 2017 championship heads to Brazil and one of the 'classic' circuits. Often the scene of a title decider the Autódromo José Carlos Pace or as you and I would call it - Interlagos is situated in Sao Paulo. With both titles already wrapped up the gloves can come off in the final two races and we'll likely see action up and down the pack, as team orders previously enforced are relaxed by their respective camps. The anti-clockwise circuit provides yet another challenge at altitude, situated 782m above sea level it ranks as both the second highest venue and second shortest on the calendar, with a 43m elevation change throughout the course of the lap. Power and downforce is still sapped, albeit not as much as last time out, with air density only down around 10% compared to 25% but it's the differing demands of the three sectors that often prove the most challenging. The circuit sits in the upper spectrum for ICE duty, as whilst it's a short lap the driver is at full throttle for around a quarter of the lap and whilst not on par with Mexico the elevation change on the long straight between the last and first corner do put a strain on the turbocharger as it's spun harder to achieve the same results as at sea level. 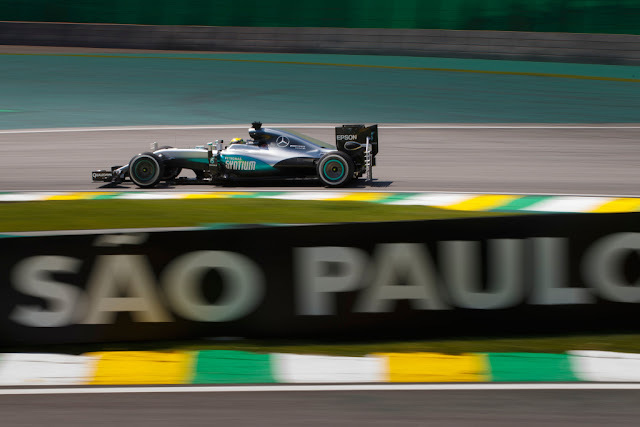 Pirelli have continued the trend of going one step softer in Brazil, selecting the Super Soft, Soft and Medium compounds. 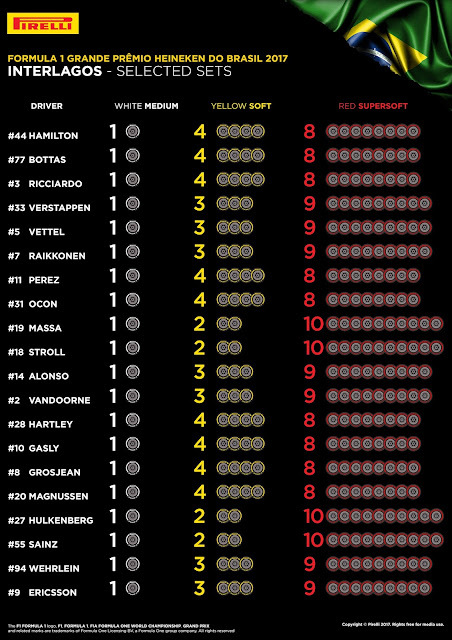 Every driver has opted to take only one set of the medium tyres, making a mockery of the mandatory compound selection process, especially as it's unlikely any of them will actually be used. The variation therefore comes from the two softer choices but again only really Force India and Williams stand out in that respect, selecting 10 Super Soft sets and only 2 soft sets for their allocations. 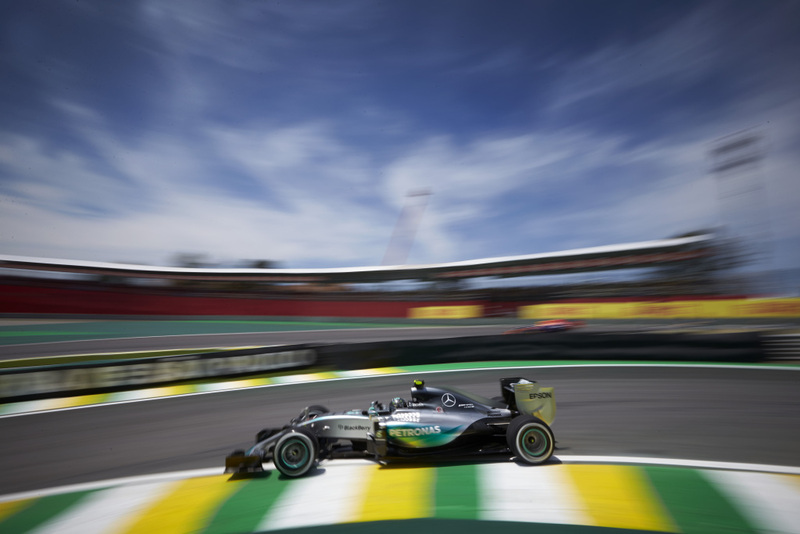 Another large tyre pressure delta features in Brazil with the teams instructed to run no less than 22.5psi in the front and 20psi in the rear (2.5psi delta), with camber limits set at -3.25 and -2.0 respectively. The right rear tyre takes the most punishment at Interlagos as all the tyres undergo high energy demands, with high combined lateral and longitudinal forces. With four wet races in the last nine years it's also a circuit that can throw up the odd surprise or the opportunity to marvel at a drivers innate ability to control the car in those conditions - much like Verstappen last year. Expect a slew of test parts and associated kiel probe rigs attached to the cars in Brazil, as the teams really start to evaluate setup and aero parts with an eye on next years cars. I just want to see a race where nothing breaks, no pre race penalties and the Hulk on poll again!